These Umbrellas are highly decorated Garden Umbrellas, generally used as decoration, as Bride & Groom Umbrella and also as Sun shades in parties and Weddings. They come in a variety of colors in Velvet, with hand patch work and Mirrors embroidery on exterior of the Umbrellas. The interior has a satin or brocade cloth for a superior finishing. The most commonly used Velvet colors are, Maroon, Fuchsia, Blue and Red. You can also request your own theme color and our creative team will source the fabric for your Umbrella and design it according to your choice and taste. 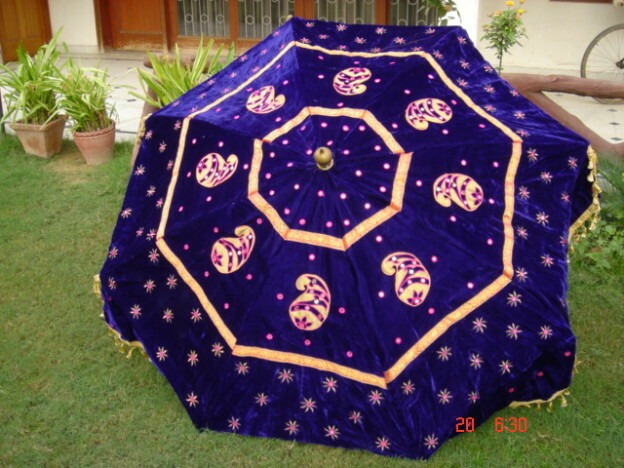 We also make very beautiful Silk Umbrellas for party in vibrant colors. Our richly decorated Wedding Umbrellas are used as party props at weddings and events by the modern day event and wedding planners. In keeping with the latest trends of theme weddings we are asked to design and develop special Wedding Umbrella for the Bride and the Groom. Decorated with rich hand embroidery, these Umbrellas also have a good demand in the photography market as a wedding prop. We are the Best Party Umbrella Manufacturers, Garden Umbrella Suppliers, Wedding Umbrella Distributors in New Delhi, India. We have been exporting our high end Wedding Umbrellas World wide from the last 40 years. Weddings in India are a festival of colors and very bright hues. Wedding planners are using richly decorated Large Umbrellas to add an extra glamor and grandeur to the whole wedding scene. Our popular Garden Umbrellas used at the Wedding venues include, the Applique Work Umbrella that is a very beautifully hand crafted colorful large Umbrella and Sun Shade and also the very vibrant Silk Umbrella for theme weddings and party.